I have been working on a form of artistic encoded information transfer. Each of these images contains a word, that has been converted from ASCII to binary and then used as the foundation template for the resulting image. I use colors and the form to try to communicate the word and a feeling of it. In a computer simple text is in a format called ASCII, and in ASCII each letter is made from 8 bits (1 or 0), or one byte. For example the ASCII letter "L" is actually made from 8 1's and 0's in the following order: 01001100. I took the word "Love" and converted it into binary code. So each row of 1's and 0's is a single letter. 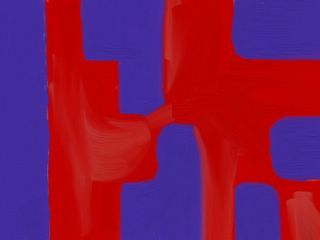 Then, I used this pattern of 1 and 0 as the basic form of the painting. In this image, there are four lines of numbers, one for each letter of the word, and eight numbers across. Then I paint all the 1's one color and all the 0's another color. In this case red and blue. Now that you know this, you can look at any of the images, and convert the pattern into binary, and then the binary into ASCII letters and finally put it together into the word it represents. This shows that there can be hidden meaning in patterns that can be right in plain sight. We may never see them and understand the meaning of it unless we know how to look at it in the right way. Love is in plain sight, if you know how to see it.